Picking and choosing designs for your custom home can be extremely stressful. Consider some of the options provided below by Forner-Lavoy when designing your dream home. At Forner LaVoy Builders, we know that choosing a dining room design can be a difficult process. Choosing the right design for your taste while also fitting it into your custom home can cause issues, but we are here to help. Long and Elegant: Nothing says formal dining and entertaining like a long table in a formal dining hall. 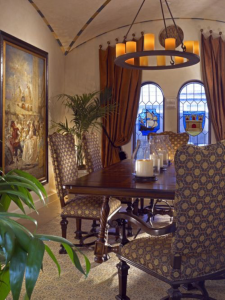 If you love hosting with a traditional flavor consider designing a formal dining room. Windows: Fabulous views are meant to be enjoyed as often as possible. If you’ve got one, plan your dining room so you can enjoy your meal while looking out a window and taking it all in. Arched Ceilings: These breathtaking ceilings are the perfect design for enhancing an eclectic, romantic or Baroque style atmosphere. Modern: In direct contrast to the arched ceilings above the modern look is all about clean straight lines, big open spaces and neutral colors. This un-cluttered design style is both simple and striking in your custom home. Chandeliers: There are chandelier designs to match any style. 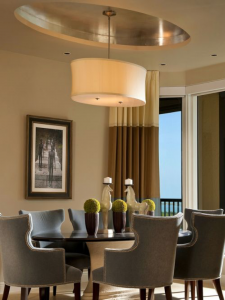 Make sure your dining room design features enough ceiling space to fit the chandelier of your dreams. 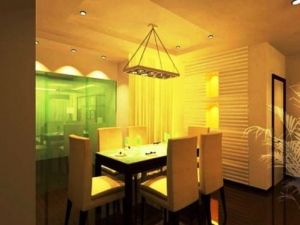 A geometric design can make your dining room look balanced and attractive. 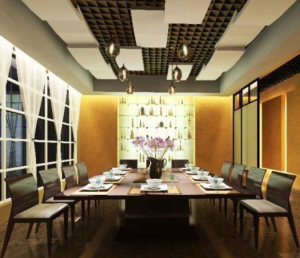 Whether your custom home has a modern or traditional style, there are many ways to work geometric dining room design patterns into your decorating scheme. Here is a look at just a few – use them as inspiration and come up with your own variations. Work texture into your room by choosing soothing sheepskin throws for the backs of your dining room chairs. Then, make every other choice in your room a geometric one — choose symmetrical, rectangular windows, chairs with clean lines and a tabletop with a geometric pattern inlay. A geometric wall hanging can give your room plenty of character. In this case, aim for simplicity. 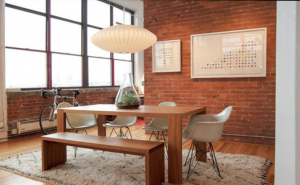 You can hang a piece with a simple dot pattern or clean lines, paired with furniture with clean, modern lines. Geometric lines can be very bold. If you want to tone them down for a softer look, use pastel colors like light purple, yellow and green in your decor. Are you looking for help designing the custom home of your dreams? Contact Forner Lavoy Builders to learn how we can bring your dreams into reality. Under the sea: Perk up an otherwise plain bathtub with shades of blue and green, and add shower curtains with a fish design. Creative artist: Make the bathroom serve a dual purpose by adding a blackboard where your kids can draw and scribble. Math whiz: Post multiplication tables on the walls so your kids can always be learning! Fairy princess: Add scented candles and decals of flowers and butterflies to your daughter’s bathroom for a mystical, magical effect. Safari adventure: Spice up a bathroom with an African jungle theme by adding earthy shades and cartoon animals. Funky geometry: Incorporate shapes such as circles and squares on the bathroom walls for a clean and simple yet fun theme. 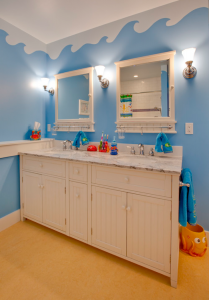 Whatever kids bathroom design you choose, hire only the best professionals to bring your vision to life. We at Forner – La Voy are happy to do that for you. Contact us at 913-385-3817. Make it the focal point of the room: The fireplace should attract attention to itself. You don’t want it to be obtrusive, but you do want it to be the first thing people notice when they enter the room. Include lots of detail: Whether stone or wood, be sure that the fireplace has plenty of distinctive features to be admired and enjoyed. Place it appropriately: Set it at the foot of the bed to illuminate those romantic evenings, or set it off to the side with a table and chairs for those late night reading sessions or discussions with your spouse. Safety first: Remember to place your fireplace in your custom home so that curtains, carpets, and other flammable materials are at a safe distance. Forner – La Voy would be happy to assist you with your design plans. We invite you to contact us today to learn more about the custom home services we offer our clients. 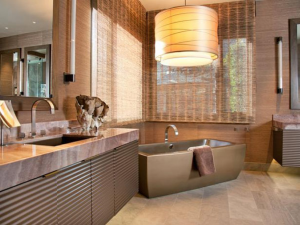 Have you ever walked into a bathroom and immediately been stunned by its gorgeous design? The secret to that beautiful bathroom design was probably found in the window. Bring the look of nature indoors with natural fiber shades because they work particularly well with grass cloth wallpaper. 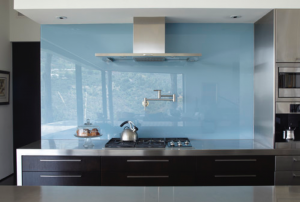 Give the window itself a little character by opting for textured or patterned glass. Feature large, grand windows in a spa-style bathroom. Accentuate them with drapes and valances. Have a little fun with color around your window because this is the perfect place to play with a spotted shade or a funky pattern. For the classic look, try outfitting your window in traditional white blinds. This pairs well with neutral wallpaper and rugs. Woven, textured shades give off a natural vibe, which is nice in a more rustic, country-style home. Give your room an airy look with sheer shades or curtains. If you’re looking for bathroom window design tips and advice in the Kansas City area, contact our experienced designers at Forner – La Voy Builders, Inc to plan your next project. Dark Accent Walls. Painting an accent wall a deep shade of grey provides a striking contrast to the white walls within the room. Doing so provides a solid foundation that works very well when complimented with modern furniture pieces. Go dark, but not too dark. Using light brown paints and fabrics creates a subdued appearance. When highlighted with touches of dark brown and black, the ambiance that it creates becomes very relaxing. Join the Navy. Navy blue walls always look elegant when coupled with white trim and soft lighting. Dark Browns, Grays, Greens. The darker the color you choose, the more bright accents you’ll need to keep the room from feeling like a cave. Thus, consider pairing these with white comforters, chairs, and pillows. Our team would be happy to answer your questions about your custom home bedroom design with dark walls. We invite you to contact us at Forner – La Voy Builders and we’ll be glad to point you toward the styles and ideas that will suit you. Although office spaces aren’t really known for their interior design, there’s no reason why you shouldn’t put some effort into the design of your custom home office. In fact, why not match the area with the rest of your custom home by employing a gray home office design? Gray may sound boring, but it can actually help create an incredibly dynamic and elegant look. 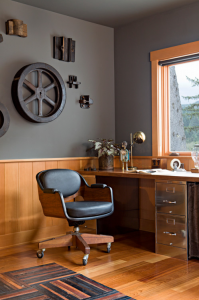 Try using a light gray color for three of your custom home office’s walls and then use a darker gray for the fourth wall to add contrast and weight. You can also choose to use a gray wallpaper that has texture if you’d like to create an accent wall. Another option to make your custom home office a little more interesting is to add a gray area rug with a bold pattern on it. Instead of putting emphasis on your walls, you could also surround your home office with floor-to-ceiling bookshelves painted in an elegant dark gray color. Another idea is to use a mid-gray for your walls to contrast the white trim and natural wood floors. For a contemporary look in your space, consider a gray custom home office design. Contact us at Forner LaVoy today for additional custom home design advice. 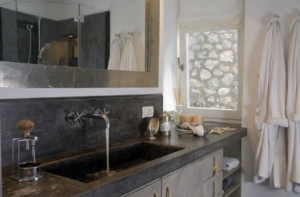 Concrete Bathroom Design is a versatile and durable building material. It can be used for everything from flooring to furniture. Concrete bathroom design is most certainly one of the most stylish looks in town. One of the most appealing aspects of designing with concrete is that it can be formed into any shape that you desire. This makes it ideal for use within modern bathrooms as it can be used to make a personal statement whether you use it to construct a sink or build the tub from. A popular choice involves using concrete to build floating shelves and sinks that extend naturally from the walls. This works well whether you are using it to create contrast against brick or plaster, or using it as the natural extension of a concrete wall. Naturally, concrete can also be used to create the floor. It’s easy to use pressed concrete to create refined patterns that mimic natural stone at a fraction of the cost. Forner La Voy Builders, Inc. would be happy to help you bring your concrete bathroom design to life. We invite you to contact us to learn the ways we can set your plans firmly in place. Is your dining room lacking a little bit in the style department? If it is and you want to spruce up your dining room design, consider using red, black ,and white together for a unique and bold look. Minimal – Go for a minimal look by keeping your walls white and using a large white dining table. Surround it with red chairs to help create the focal point of the room and then add a touch of black by adding black décor elements to the table’s surface. Elegant – Add contrast to a white room by using a black floor. Lay down a light area rug in your room. Use a black table with a combination of white and red chairs. Casual – For a more casual look, use black chairs to compliment your wood table and floors. Keep the walls white, but use a large red barnyard door to add visual interest. Consider some of these ideas when choosing your custom home dining room design. Be sure to contact us at Forner LaVoy today for additional interior design advice. Many people dream of owning a cabin in the woods. 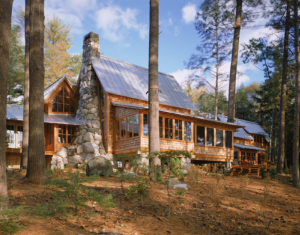 The rustic feel of a wood cabin design makes it an ideal place to get away from the hustle and bustle of the city; that’s why we love building them for our clients. There are many designs you can choose from. You could build your cabin from raw-cut timber for a truly natural appearance. You could also select to use cut timber for a slightly more modern and refined look; either design will look great depending on your individual tastes. Whatever your choice, be sure to keep the wood exposed and include plenty of stone, lots of windows, and enough room inside to settle in and get comfortable. Be sure to take advantage of the topography and geography around your property. Make sure to choose a location that allows you to maximize the views and have easy access to lakes, streams, and paths located around your property. Our team would be happy to help you select a wood cabin design that fits your lifestyle and design vision. We invite you to contact us at Forner-La Voy Builders today to learn more about our home design services. Homeowners located in the Kansas City area who want to change up a bedroom design may consider selecting a Mediterranean bedroom design with styles influences from France, Spain, and Greece. This Mediterranean bedroom design will go perfectly in your custom home. There are certain characteristics that go with the Mediterranean style. These include wood, high ceilings, soft-toned colored furniture, and fabrics. A touch of dim lighting brings it all together! When choosing your ceiling type for a Mediterranean bedroom design use exposed beams on your ceiling with an antique chandelier. This will deliver an elegant style which is key to the Mediterranean bedroom design. 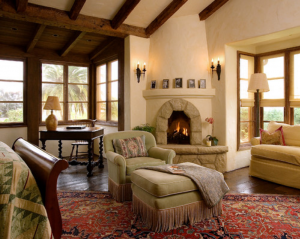 Therefore, if you go with a wooden ceiling, you may select having a fireplace that runs up to the wooden beams. When deciding on colors, a canopy bed with warm colored chairs including olive green or brick red, with a minimal amount of window treatments. Next, use a valance on your windows of the same color as the chairs and ottoman. Finally, vintage furniture will help create a Mediterranean mood accompanied by a wrought iron chandelier. Lamps can add a romantic feel of the room. But, only if they are placed strategically near the bed and in corners. However, too much light will take away from the Mediterranean mood. Dim lighting is essential to a Mediterranean bedroom design. After ceiling, colors, and lighting you’ll be all set for your Mediterranean bedroom design! Choosing a staircase design for your home isn’t always easy. From selecting the material to making sure the rise is just right, here are some tips that you’ll want to think over. Curved and spiral staircases are ideal for small spaces. If you plan to tuck the staircase in the corner of a room, these are your best bet for the best fit. Floating staircases look great within modern and contemporary architecture. These extend directly from the wall and can be used to create an open feel. Open staircases without rails look fantastic, but they are a safety hazard if you have children in the home. Compromise by installing a glass railing that preserves the open appearance while protecting your loved ones. Use your staircase to create a little extra storage and shelf space. You can install shelves and cabinets beneath the stairs. You can also inset shelving along the walls of the staircase itself where you can showcase your favorite possessions. The team at Forner – La Voy would be happy to help you with choosing a staircase design that rises to the occasion. We invite you to contact us by calling 913-385-3817 with your question and design needs. Fall is here! There is nothing better than being able to enjoy the cooler temperatures while hanging out with family and friends around your own personal backyard fire pit. Designing your fire pit? it is important to have adequate space for both.The actual structure and any surrounding seating or other amenities. Often location and dimensions are governed by city and county. Zoning ordinances and even if your community doesn’t address fire pits specifically, always remember to position it away from any other combustible materials. Determine what materials you want.The pit constructed from and if you prefer it to be permanent or portable. Decide in advance the type of fuel you plan on using. Adding seating, tables and lighting can make time spent around your fire pit so much more enjoyable. Decide in advance on whether you want the seating to be stationary, poured in place concrete benches, or traditional moveable patio tables and chairs. 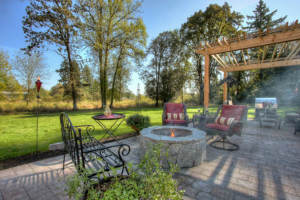 Forner – La Voy Builders can assist in creating the fire pit of your dreams. We invite you to contact us today for additional information. Whether you have a small or large home, designing your hallway will always be something you will need to consider as it is the pathway into other rooms in your home. It gives an impression before the guests see what lies in the rest of your place. We can help you with a variety of ideas that will help make your home even more beautiful. Some ideas to consider for your hallway include hanging a large white mirror against silver wallpaper and small statues on the floor. Add diversity with an eclectic style as you can have the freedom to mix and match to create a mood and creates anticipation for seeing the rest of your home. Tile flooring with wooden wall panels is another great idea along with either a chandelier or traditional ceiling lights. Simplicity can also be effective with a wooden floor, along with some photos hanging on lightly colored painted walls. For more boldly colored walls, consider using a painting that is able to pick up the loud color. Place a large mirror across from the painting. We invite you to contact us at Forner – La Voy Builders today for more ways you can begin designing your hallway. Minimalist home office design is something that busy professionals truly appreciate. With clean lines and uncluttered appearance, it is ideal for the person who likes to work without distractions. Start by clearing the desk and placing it where distractions will be minimized; facing a wall, or in front of a window are both popular choices in this regard. Next, create concealed storage spaces near the desk. Within these spaces you can place your files, books, and electronics to keep them organized and help reduce the clutter in your area. Next, turn your attention to the decor. Insert shelves provide a beautiful place to showcase a few of your favorite collectibles. Added with a couple pieces of your favorite artwork hung carefully along the walls, thus creating a backdrop that is inspiring and refreshing. We invite you to contact us at Forner – La Voy Builders today! Receive more information about the ways we can help create a space ideally suited for a minimalist home office design. We’ll be happy to show you some examples of projects we’ve completed and discuss your specific design goals.